IDC's recently published report “IDC MarketScape: Worldwide Virtual Client Computing Software 2016 Vendor Assessment” (doc #256606, November 2016) named VMware as a leader. 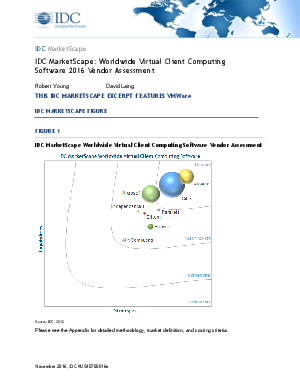 Be the first to receive an excerpt of the IDC MarketScape: Worldwide Client Computing Software 2016 Vendor Assessment, available from VMware. Register now to access your copy.